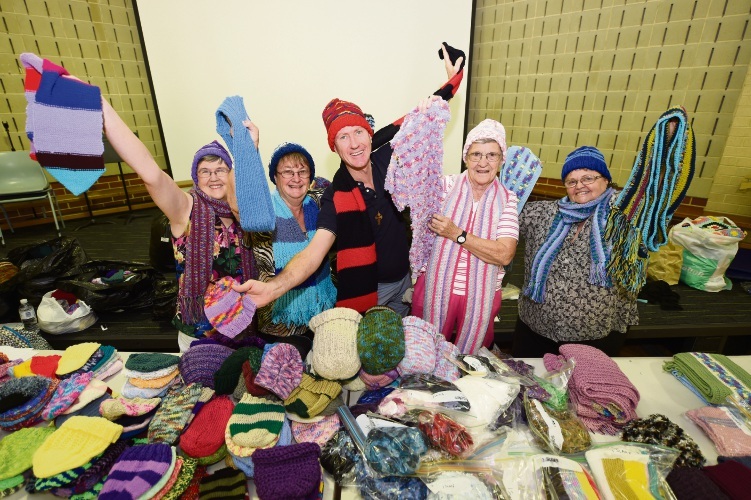 Linda Trefry, Lyn Butcher, Father Bruce Hyde, Rosalie Chadwick and Robyn Ricket at the Annual Charity Knit-In on Monday. A RECORD number of winter warming donations have been made to local charities, thanks to a community-level push. The Annual Charity Knit-In wrapped on Monday at All Saints’ College in Bull Creek, bringing to a close 12 months of work and re-setting the cycle. Co-co-ordinator Linda Trefry said the 1580 items, a mix of clothes and soft toys, was a record high for the team. Those creations were donated to Anglicare WA, Charity Link, the Salvation Army, The Shopfront, Little Things for Tiny Tots and St Alban’s Anglican Church at Highgate. “It’s very fulfilling,” Ms Trefry said. Ms Trefry said donations were already being created for 2019, with some unfinished on Monday to be offered for the community’s vulnerable in 12 month’s time. Donations will come in throughout the year.